Marian Bijlenga, Nick Cave, Wenda Gu and Ritzi Jacobi explore the socio/cultural implications of hair in their beautiful yet alarming applications. In his ongoing global art project for the 21st century, Wenda Gu gathers volumes of human hair to create grand temples, transparent monuments from "body waste" materials. His massive installations invoke cultural dialogues through simulated text. The hair brings with it universally recognized silent messages of ceremony, strength, and shame. Nick Cave has the ability to transform seemingly ordinary objects into powerful spiritual icons. 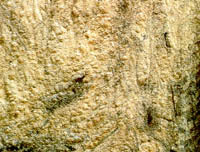 He uses the fetishistic presence of hair to engage in a dialogue between survival and decay, past and present. According to Cave, he has "embarked here on a transcendental order of recycling." 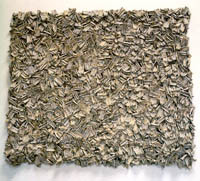 In contrast to the two artists above, Ritzi Jacobi chooses animal hair for its structural properties and graphic uniqueness. She draws with fiber to create bold abstract works recalling huge minimalist paintings. Marian Bijlenga suggests signification with horsehair fashioned into calligraphic strokes, points, and spirals in a language all her own, whose echo, the shadows that these marks incur, reiterates her message. 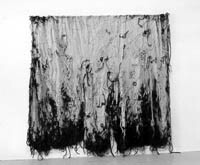 As we define Fiber Art, hair, with its implied codification, is the ultimate linear, pliable material. 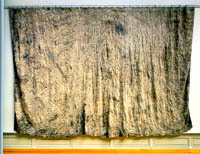 human hair (collected from 300 barbershops around the world) made four pseudo-languages & world ethnical maps composed into a curtain wall. A collaborative performance with South African choreographer Nomsa Manaka. 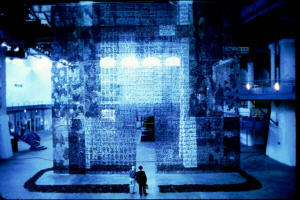 Site-specific installation for "Second Johannesburg Biennial", Institute of Contemporary Art, Johannesburg, South Africa. 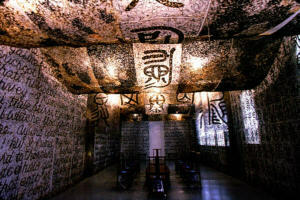 human hair (collected from 325 barbershops around the world) made into a temple of pseudo-languages. Interior houses a meditation setting of Ming furniture made of huang hua li wood: naked TV monitors on twelve lamp chairs, eight spring stools, 2 tea tables. Site-specific installation for "Inside Out", PS1 Contemporary Art Center, New York City, NY. human hair (collected from 325 barbershops around the world) made tower of pseudo-languages. 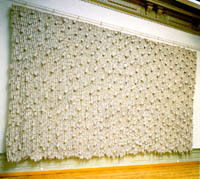 Site-specific installation in permanent collection of San Francisco Museum of Modern Art. 17" x 5" x 3/4"
30" x 2" x 9"
38" x 12" x 6"
6'7" x 7'11" x 3 7/8"
14'9" x 26'3" x 11 7/8"